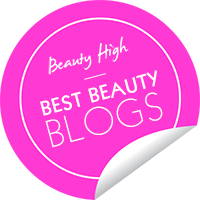 So the question I get asked most often by women is, "What are the products you truly can't live without?" 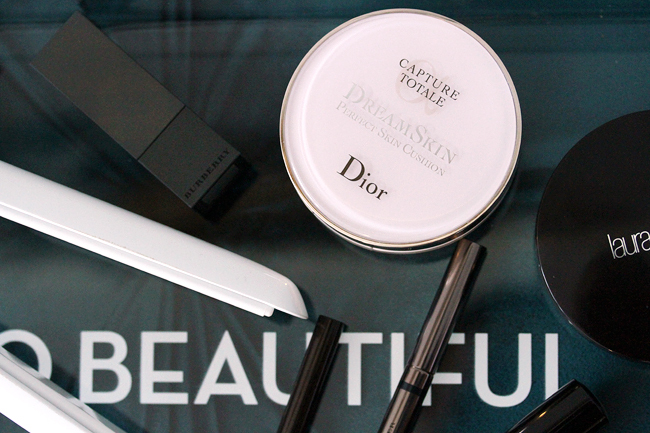 This is an honest look at what I keep on my vanity tray — but none of it is new or totally picturesque since this is stuff I really do use daily. I suppose I could have called this a holy grail post, but the fact is that I change HG products at least a couple times a year since technology is always improving. 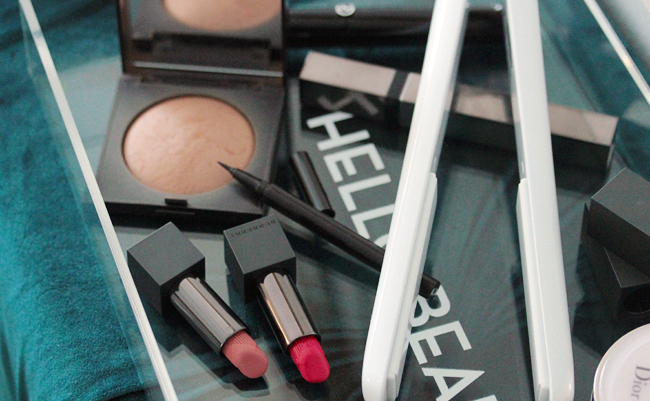 But let's dive into my essentials! 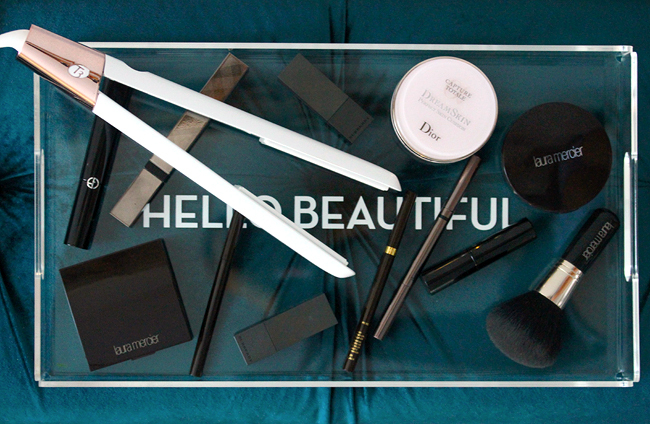 Firstly, my acrylic tray was a gift but Nordstrom does offer a stacked acrylic organizer in case you're looking for additional storage for your daily essentials. The fact that I can move my favorites around easily means that I can apply makeup in whatever room I feel like, although I know I'm the odd one out in that sense. I don't have a set desk or single area where I get ready. I have been styling my bob daily as of late since the extra inch of growth makes it a little too long to wear straight. I lift and curl the roots and then straighten out the ends with my T3 Single Pass Luxe Styling Iron. There are quite a few beautiful and thoughtfully constructed options at Nordstrom right now, but I think the T3 manages to curl and straighten equally well. It doesn't leave my hair frizzy. 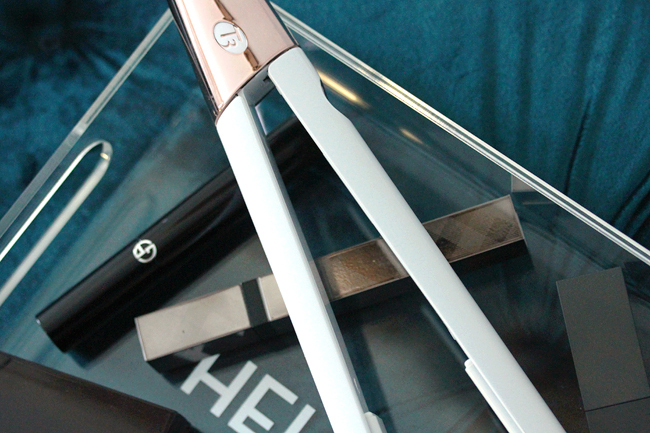 Plus I love the white/rose gold accent design because it stands out from all my other hair tools! Tip: I use my BioIonic when I want super pin straight hair and my GHD when I want tighter curls. 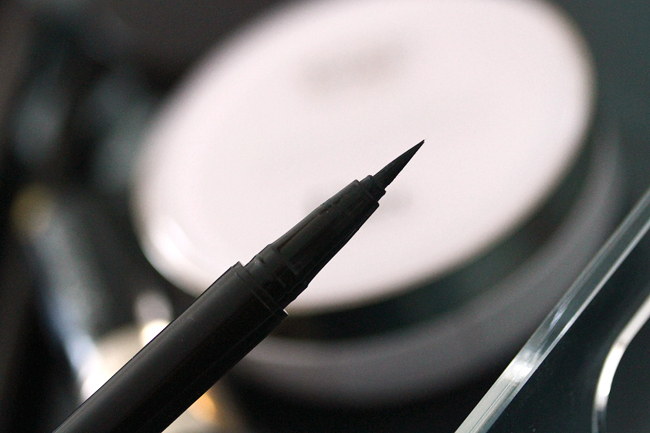 The brand new Laura Mercier Instant Ink liquid liner is my latest obsession though! I've used it for two weeks straight. 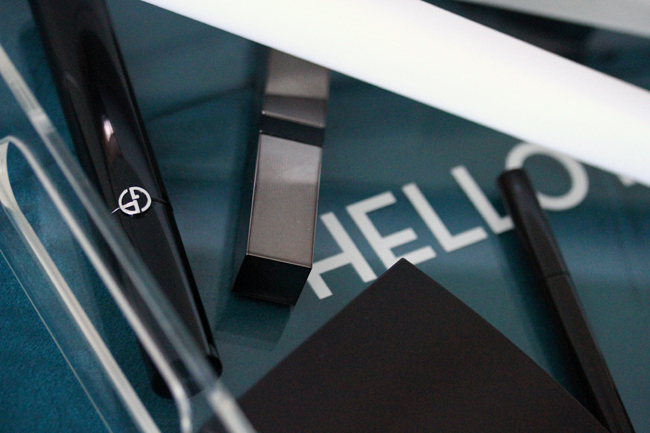 The formula dries down matte and comes with a brush tip that doesn't pill the way some felt tips can. I have been working on perfecting a thinner, more natural looking line as opposed to the strong cat eye that I always sport, and this fine tipped brush makes it so easy for me to practice! It does last almost 24 hours without smudging and it really doesn't flake; I know because I accidentally fell asleep with it on a couple times. Naughty me but now you know! I don't wear liquid eyeliner every single day because I'm lazy, so I opt to wear mascara and pencil liner on those days. 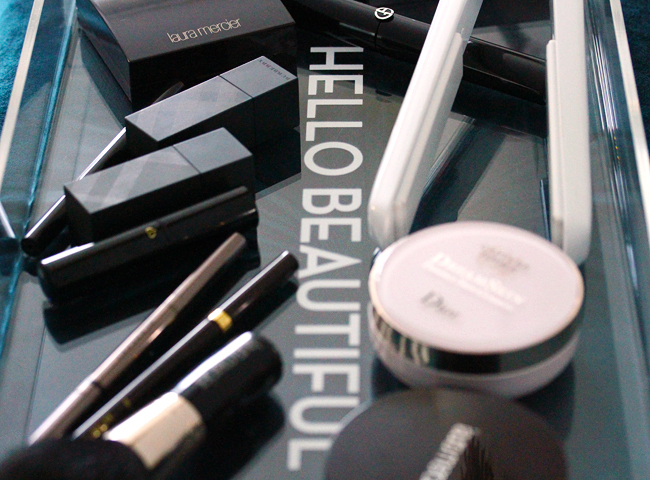 I switch off between Burberry and Armani mascaras, but they're entirely different. 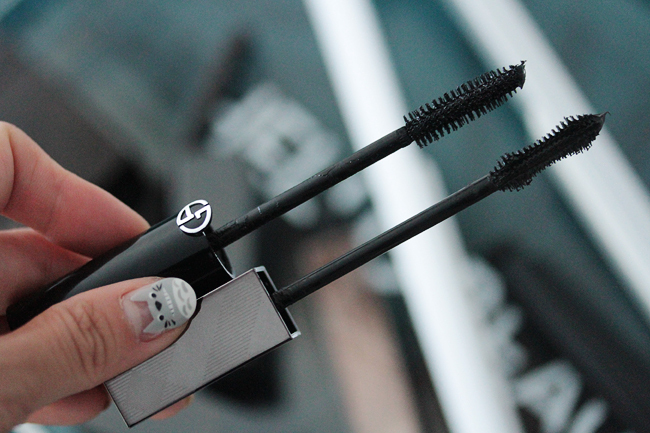 The Giorgio Armani Eyes to Kill Waterproof Mascara is truly my Holy Grail. It lifts, separates, and holds curl while providing lots of volume. Since it is so long lasting, I like to wear something softer and easier to remove. Burberry Cat Lashes Mascara fits the bill, although I do wish it came in a waterproof formula sometimes because it takes longer to dry than Armani's! Nordstrom should have another Mascara Madness event where you buy 2 mascaras and get 1 free very soon, so keep your eyes peeled in November! I've talked about the Dior DreamSkin Cushion many times now, but I have to keep talking about it because it's so phenomenal. It is the most expensive cushion on the market, and probably the sheerest, but it makes my skin looks so even! It reduces redness but doesn't looking like I'm wearing makeup. The finish isn't too dewy so even those with combination and oily skin could use it. Even my mom is obsessed with it and she gave up on base makeup a long time ago! I bought 030 because 020 is just a touch too light for my current tan, but 030 is significantly darker (MAC NC35 or Chanel B40). I decided to stick to 020 and color balance with bronzer. Since I wear the Dior cushion with concealer on my acne scars daily, my hair tends to stick to my foundation. 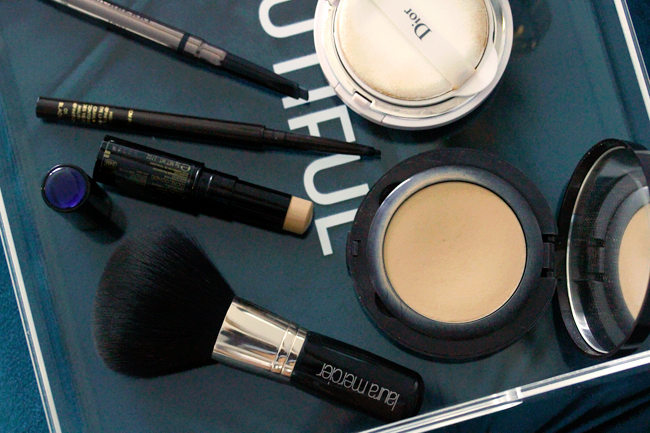 That's why I like to use a dusting of powder to set everything in place. For the last few months, I have been wholly dedicated to Laura Mercier's Powder Foundation in #5. When it first launched a year or so ago, I wasn't in love, but I gave it another shot because I love the color match. It works best applied with the white sponge on top of concealer, but I like to use her Bronzer Brush for very sheer all-over application. I wouldn't say this is "better" than Burberry's Fresh Glow Compact, but Mercier's formula is totally shimmer-free and the coverage is easier to build to full. Next up is my bronzer essential because this year, I tried a ridiculous amount of bronzers this year, more than ever! I finally found my true holy grail though, and it isn't too red or too brown or muddy or glittery. I absolutely love the naturally sun-kissed look of Laura Mercier's Baked Matte Radiance Powder in Bronze #2, and I try to apply it only where I did not apply any powder foundation. It still provides my face with plenty of definition so that I don't have to contour but more importantly, I get a soft and glowing look that never gets greasy. If you're looking for a slightly more affordable alternative, try MAC's Skinfinish Natural. Now let's talk a little bit about color! 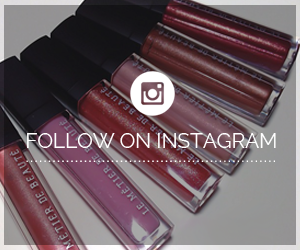 I love the Burberry Lip Velvet Lipsticks but most of you have probably heard that by now since I've talked about them on YouTube. This reformulation was extremely well done and the thirteen shades offered are universally flattering, which Burberry consistently excels at. I like them almost more than the Christian Louboutin Velvet Mattes which are significantly deeper in tone, very intense. All the Burberry shades can be worn day or night, and I find them more versatile since all of them look lovely when worn sheer or opaque. 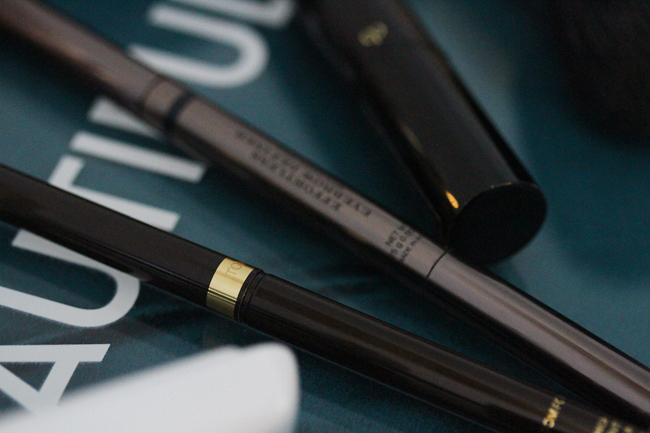 The Burberry Effortless Brow Pencil has been one of my go-to eyebrow products for years, but the Ebony shade has made me fall head over feels for it again. Although I still use Surratt's pencil since that one is ultra precise, Burberry's ultra smooth formula has the perfect balance of wax and powder. I use far fewer strokes to complete my brows and although it has a thicker angled tip shape, I can still manage to fill in only the sparse spots. It helps my brows look noticeably fuller and the pigmentation is phenomenal so give it a try. Although I haven't tried this on my upper lash line yet, I highly Tom Ford's High Definition Eyeliner Pencil for tightlining (inside of the lid). This fine tipped mechanical pencil is easy to use and glides on like butter. I don't have to constantly go over the same line multiple times because each stroke is so saturated! It is technically waterproof but can smudge and slide a little by the end of the evening. Still, it sticks much better than most other pencil formulas. I've talked about this one lots and lots and lots, but I've been using this for years now and seriously can't survive without this cult classic. Nothing tops the Cle de Peau Concealer for pore and textural issues like my acne scarring. 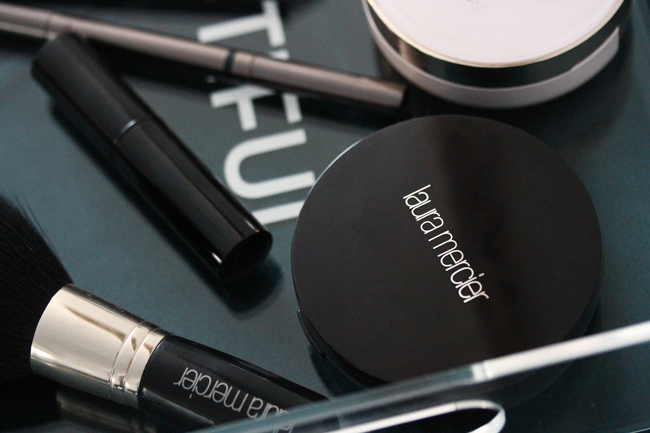 It is easy to apply and blend, plus it lasts all day when topped with the Laura Mercier powder foundation. Nordstrom is currently offering a really sweet Gift with Purchase, full sizes of the Brilliant Enhancer and Perfect Lash Mascara, for those that want to stock up on your Cle de Peau favorites!